Over the past year or so, American Jewish opponents of Israel like writer and activist Peter Beinart have sought to intimidate and demoralize Israelis by telling us that American Jews either no longer support us or will stop supporting us if we don’t give in to all the Arabs’ demands. But statistical evidence exposes these threats as utter lies. According to mountainous survey evidence, the American Jewish community writ large remains deeply supportive of Israel. Two surveys released last year by the American Jewish Committee and Brandeis University’s Cohen Center for Modern Jewish Studies showed that three quarters of American Jews care deeply about Israel and that Israel is an important part of their Jewish identity. The Brandeis survey notably showed that young American Jews are no less likely to support Israel than they were in the past. In fact, American Jews under 30 are more hawkish about the Palestinian conflict with Israel than Jews between the ages of 31-40 are. According to the Brandeis survey, 51 percent of American Jews oppose a future division of Jerusalem, while a mere 29% would support it. Younger Jews are more opposed to the capital’s partition than older Jews are. It is notable that the Brandeis survey found that political views do not impact American Jews’ support for Israel. This is striking because among Americans at large, polls show Republicans are significantly stronger supporters of Israel than Democrats. But not among Jews. “Liberals felt no less connected than conservatives and were no less likely to regard Israel as important to their Jewish identities. These observations hold true for both younger and older respondents,” the Brandeis survey report explained. Across the board, American Jews blame the Palestinians for the absence of peace and believe there is little chance that there will be peace between Israel and the Palestinians in the foreseeable future. 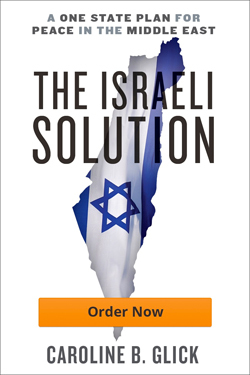 Seventy-five percent agreed with the statement, “The goal of the Arabs is not the return of occupied territories but rather the destruction of Israel”; 94% said the Palestinians should be required to accept the Jewish state’s right to exist. In light of these overwhelming levels of support, it is disconcerting to see that across the US, Jewish communities are failing to prevent anti- Zionist Jews from hijacking communal funds and facilities to finance anti-Israel activities. CONSIDER A few recent examples. In Orange County, California, intra-communal rancor is growing over the local Jewish Federation’s financial and organizational support for University of California at Irvine’s Olive Tree Initiative. The Federation subsidizes Olive Tree Initiativeorganized tours of Israel for Jewish students. As Tammi Benjamin from UC Santa Cruz explained in a letter last December to local Federation CEO Shalom Elcott and local Hillel director Jordan Fruchtman, while OTI claims to be interested in fostering good relations between Jewish and Arab students, it actually just propagandizes against Israel. The speakers who addressed students participating in the two-week trip were overwhelmingly anti-Israel. Almost all the Palestinian speakers expressed hatred for Israel. Many of the Israeli speakers represented groups that call for economic warfare against Israel and defame Israel as a racist state. Half of the supposedly neutral representatives of international organizations who spoke to the group are notorious for their opposition to Israel. Rather than end the practice of using Jewish communal funds to propagandize Jewish students to hate the Jewish state that most American Jews support and see as important to their Jewish identity, the Federation and Hillel have dug in their heels. This week, the Los Angeles Jewish Journal reported that over the past two months, allegedly acting on instructions from the Federation, two local synagogues canceled an event sponsored by the local branch of the Zionist Organization of America at which Irvine Rabbi Dov Fischer was to present information about OTI’s anti-Israel activities. Meanwhile on the East Coast, both the Washington and New York Jewish communities are embroiled in a feud over Federation funding for anti-Israel Jewish groups. In Washington, a group of pro-Israel activists operating as the Committee Opposed to Propaganda Masquerading as Art has begun a campaign to end Federation funding for anti-Israel activities. COPMA’s specific concern is Federation Funding for the District of Columbia Jewish Community Center’s professional theater group Theater J. In 2009, Theater J staged the virulently anti- Semitic post-modern passion play Seven Jewish Children by Caryl Churchill. The play accuses the entire Jewish population of Israel of mass murders that were never committed. Unfortunately, as COPMA notes, this is par for the course. In the past, Theater J’s artistic director Ari Roth organized buses to bring community members to Shepherdstown, West Virginia, to watch a production of the virulently anti-Israel propaganda play My Name is Rachel Corrie. In response to COPMA’s letter, Roth told the Forward that it “is not a prerogative of the donor” to intervene in artistic content, and claimed that attempts to limit the theater’s activities amounted to censorship or blacklisting. COPMA is not alone in its concerns. In New York, a group of activists formed a new organization called JCC Watch to force the New York Jewish Federation to end financial support to the Manhattan JCC due to its partnership with organizations that support economic warfare against Israel through calls for economic boycotts, divestment and sanctions. Like COPMA, JCC Watch asks that the local Federation adopt guidelines to prevent Federation funds from being transferred to groups and programming that showcase calls for economic and political warfare against Israel. So far, Washington’s Federation has not responded to COPMA’s letter. Interviewed by the Forward, the Washington Federation’s CEO defended giving supporters of anti-Israel sanctions the stage as part of Federation-sponsored panels on the grounds of “welcoming multiple voices.” And in an op-ed in New York Jewish Week last month, the New York Federation’s CEO defended the JCC’s partnership with groups that engage in economic and political warfare against Israel. WHAT IS going on here? According to the AJC and Brandeis surveys, fewer than 10% of American Jews tend to accept the Arab line against Israel. Given the wall-to-wall support for Israel among American Jews, why do American Jewish organizational leaders refuse to do what their members want them to do? Why are they taking Jewish communal funds to finance activities and causes that are offensive to the Jewish community? Why are they pretending that the call to end communal funding for anti-Israel activities is a call for an abrogation of free speech? To get a sense of how unprecedented this is, it is useful to consider the American Jewish community’s response to Jews for Jesus. While Reform and Orthodox rabbis agree on almost nothing relating to Jewish laws and practices, since the emergence of Jews for Jesus in the 1970s, Reform, Conservative and Orthodox rabbis have been unified in their rejection of the Christian missionary group’s protestations of being Jewish. Everyone understands that while Jews have a perfect right to change their religion, they have no right to force the Jewish community to accept Christians as Jews. That is, they have no right to change the definition of Judaism to include people who worship Jesus. Hillel organizations have rightly refused space and funding to Messianic Jewish groups. But today, American Jews find themselves helpless when a marginal group of anti-Zionist Jews demands – like the Messianic Jews of their day – communal funding and space for their anti-Israel activities. The anti-Zionist groups make the same arguments as the Messianic Jews. They call themselves pro-Israel even as they engage in activities aimed at harming, defaming, weakening and delegitimizing the Jewish state. They claim that refusing them communal funds constitutes a violation of their free speech rights. Yet while communal leaders did not hesitate to call the so-called Messianic Jews’ bluff, they cannot find the way to expunge anti-Israel groups from their umbrella organizations. The explanation for this behavior is apparently social. Federation leaders don’t mind disappointing evangelical Christians. But most of their friends are leftist. Consequently the perceived social cost of taking action against groups like Theater J, J Street, B’Tselem, Breaking the Silence and Jewish Voices for Peace is too high for many American Jewish leaders to bear. Happily, a handful of committed community members throughout the country are standing up and demanding that their communal leaders act in the interests of the communities they serve. It can only be hoped that the overwhelming majority of American Jews who clearly wish to support Israel will join these activists’ call and demand that all Jewish Federations stop allowing anti-Israel groups to feed from the communal trough. If they do, they will find that much to their surprise, the social costs of actions will be far smaller than they expected. After all, Israel’s supporters are the majority. UPDATE: Yesterday the Forward reported that in September 2009 UC Irvine students met with Hamas leader Aziz Duwaik during an Olive Tree Initiative organized visit to Israel. The Orange County Federation knew about this in October 2009 and yet not only have they continued to support the OTI, they actively blocked public discussion of the OTI as recently as this month.